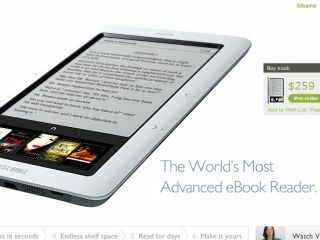 Tis the season to be Nookless it seems, with a small percentage of those in the US who have bought Barnes & Noble's eBook reader having to be content with a $100 gift certificate rather than getting the gadget in their Christmas stockings. Although Barnes & Noble insists that the problem with supply will only affect a small percentage of those who pre-ordered, it has a contingency plan and will offer vouchers. "We are working very hard to keep up with the demand and to get all Nook orders out the door and to customers on or before December 24," a Barnes & Noble spokeswoman said. Those affected have already been notified, and will get a gift certificate to ease the pain of being without the reader. Obviously UK customers are not affected because the Nook is only available over the other side of the pond, but following similar supply issues with the Amazon Kindle, not to mention the likes of the Nintendo Wii and the Apple iPhone, it's clear that getting the must-have gadgets into the hands of the early adopters is far from easy.